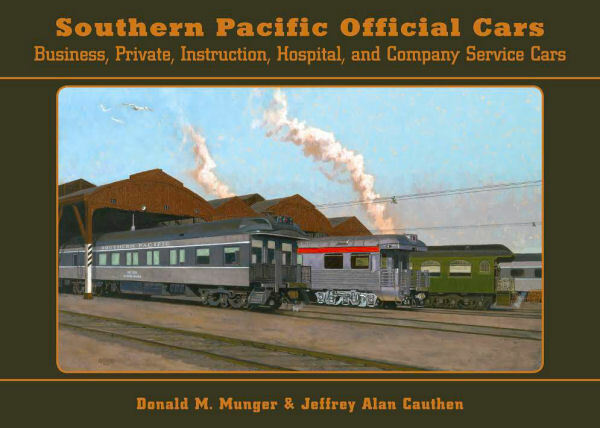 Authors Munger and Cauthen, with many credits to their names in all matters regarding Southern Pacific passenger equipment, have combined efforts once again in this massive volume which details the history of Southern Pacific and its Subsidiaries' (both Pacific Lines and Texas & Louisiana Lines) Official Cars, as well as Sud Pacifico de Mexico Official Cars and those of the St. Louis Southwestern Railway and Pacific Electric Railway. Since many of these cars were renamed and/or renumbered - often many times - a Name and Numbering Aid is included to guide the reader to a specific car of interest. An additional chapter covers Southern Pacific Company Service Cars. 590 photographs - 176 of them in color - and 110 plans, Rosters, Appendix, Color Gallery, Bibliography, Glossary of Terms and Index. A Must Have for the Southern Pacific historian and modeler. Hard cover.